Prized for its vivid rich green colour, the emerald has a long history as a jewel for kings and queens. It is the birthstone of May and symbolises good fortune and health. Emeralds from Colombia are fascinating gemstones. They feature the most beautiful and most brilliant green imaginable. They are famous for their inclusions, known in the trade as ‘jardin’. 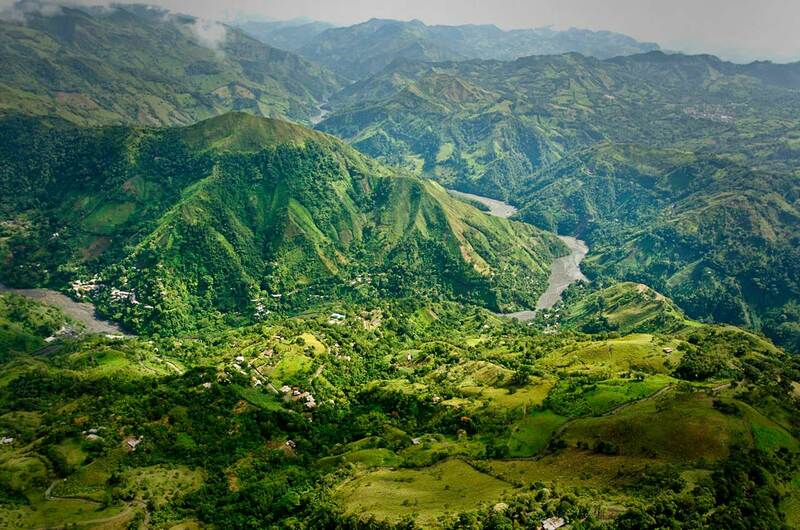 There are three main emerald mining areas in Colombia: Muzo, Coscuez, and Chivor. Colombian emeralds are located in an area known as the ‘Emerald Belt’ of the Cordillera Oriental in the Gobernación de Boyacá and Cundinamarca district. The deposits were exploited by the natives long before the arrival of Europeans in the 16th century and have been worked more or less continuously since then. 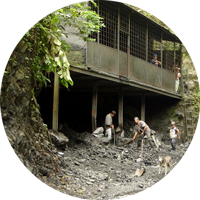 Chivor, formerly Somondoco, the oldest mine in Colombia, north-east of Bogotá. These emerald crystals are longer and cleaner than other Colombian emeralds. 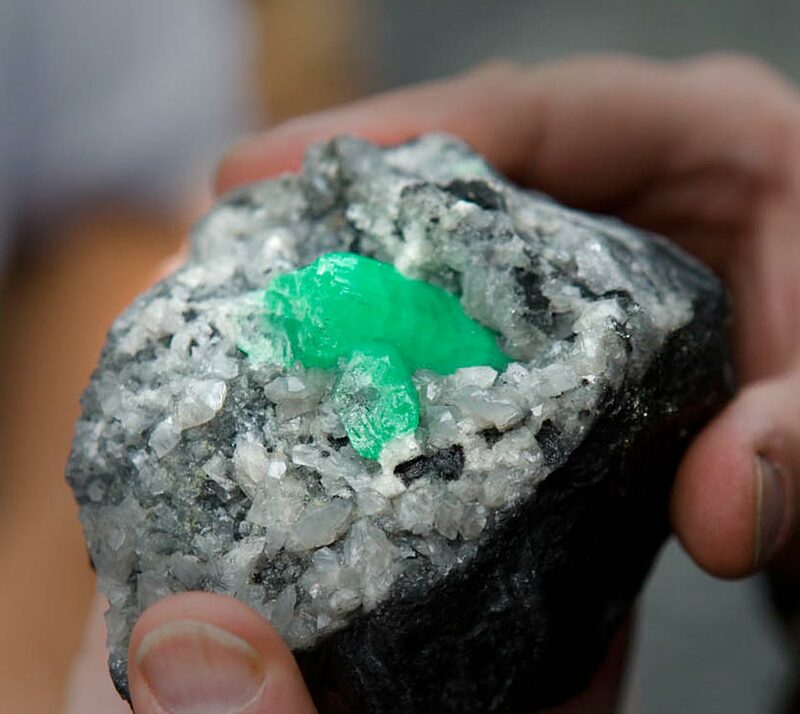 Colombian emeralds are located in an area known as the ‘Emerald Belt’ of the Cordillera Oriental in the Gobernación de Boyacá and Cundinamarca district. One major mining area was the Vasquez-Yacopi mining district, which included the Muzo mine and the city of Muzo founded by Luiz Lancheron in 1555. 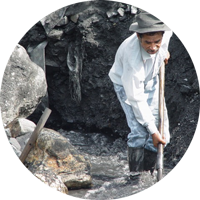 From the first mining operation by the Spaniards in 1558 until the present day, many different mining operations, such as Jose Ignacio Paris, Sociedad la Nueva Granada, Ecominas and Sociedad Minera Boyacense, have worked this area. There have also been joint ventures between privately owned enterprises and public organisations. This colour is the most prestigious green, said to be that of a particular butterfly (mariposa in Spanish) which occurs only in the Muzo area. These crystals do not form clusters or aggregates. However, Muzo emeralds tend to be shorter than those from Chivor. 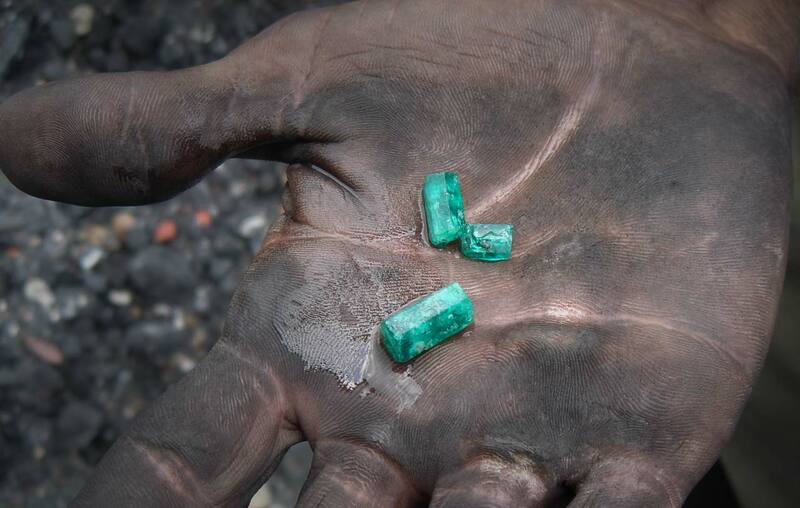 Muzo emerald crystals tend to have a more saturated colour. The deposits were exploited by natives long before the arrival of Europeans in the 16th century. Emeralds did not become common in world trade until after the Spaniards had reopened the ancient mines. 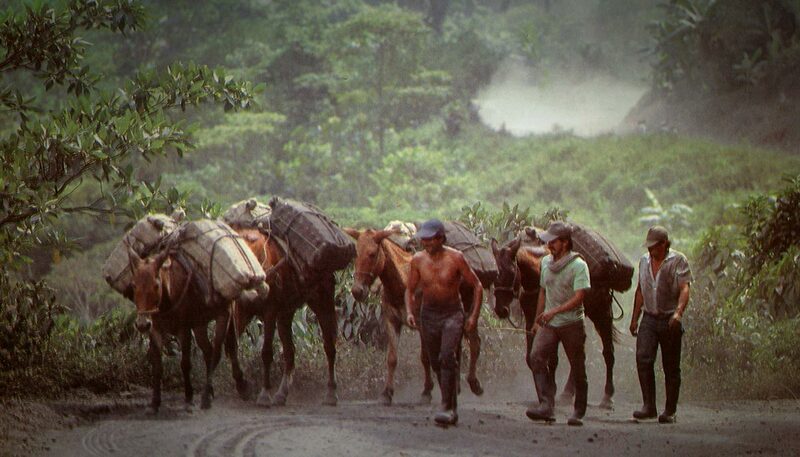 In 1886 the Colombian constitution proclaimed Coscuez the property of the nation. 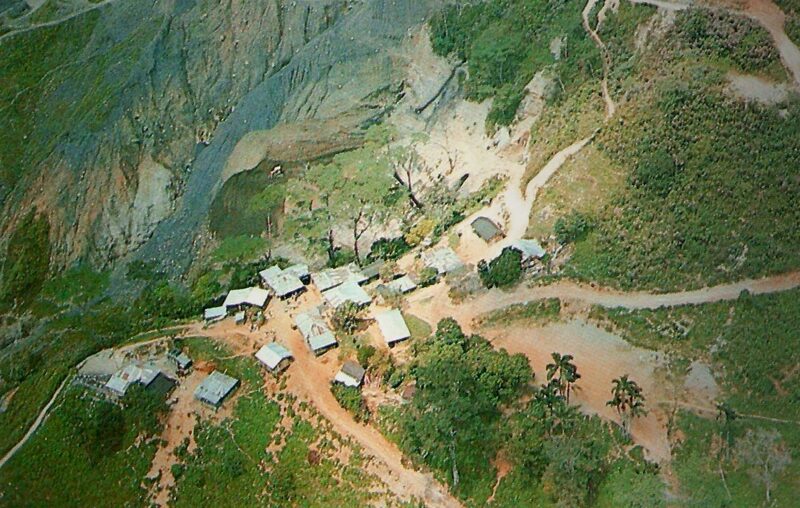 However, mismanagement and illegal mining forced the government to lease out the Coscuez area to a private mining company, ESMERACOL. The main area was stripped away very rapidly so that a significant portion of the potential emerald production was lost to the Rio Itoco. 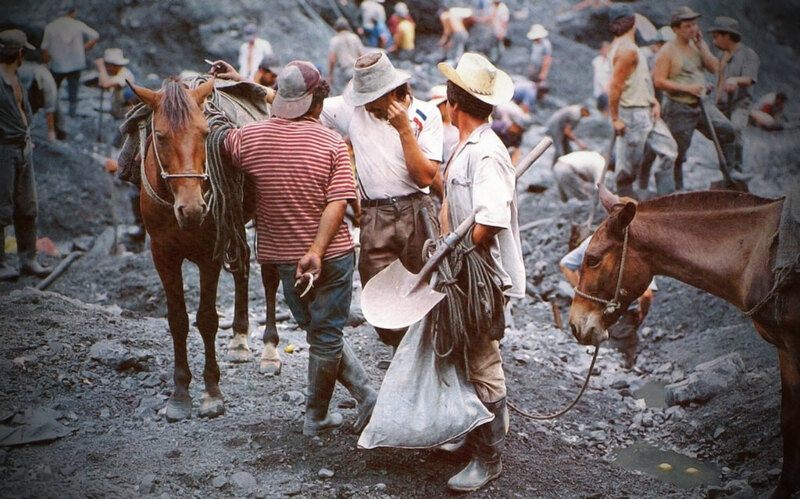 In times of peak production, around 15,000 guaqueros (independent miners) worked this area every day. 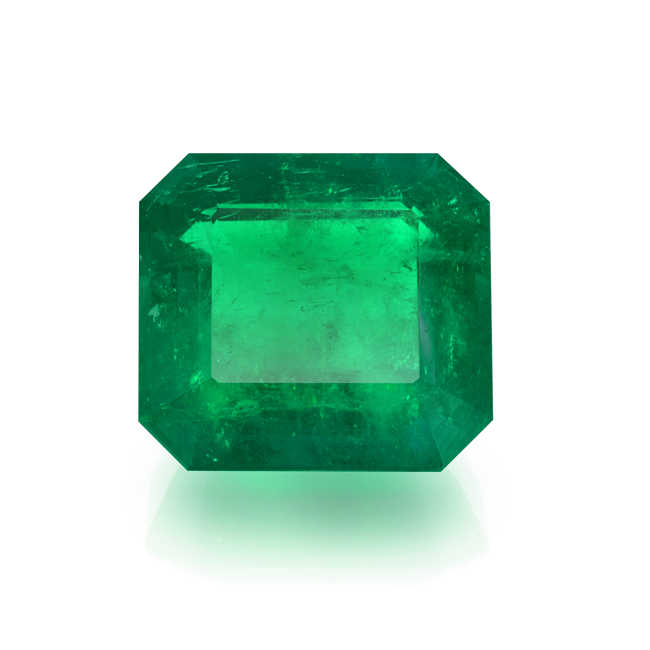 The colour of the emeralds from the Coscuez mine is bright green with a yellowish undertone. The appearance of the emerald is translucent and some cracks and fissures are visible. 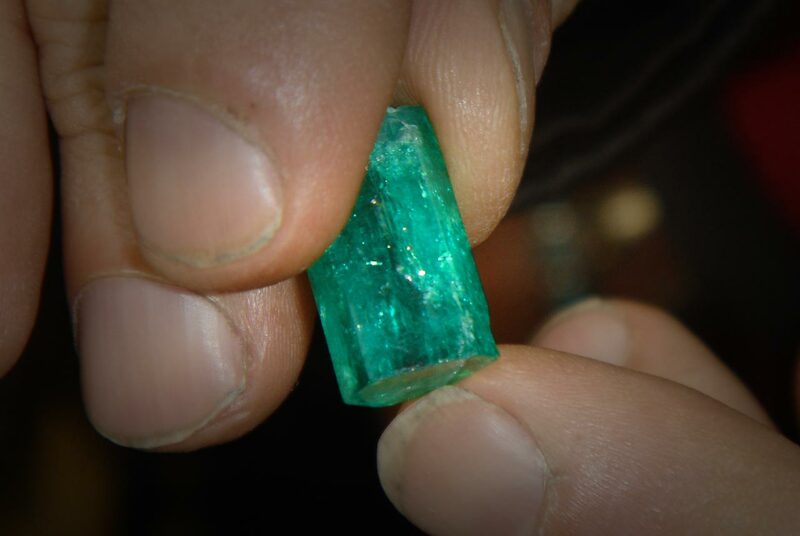 Emeralds from Coscuez generally have fewer inclusions than those from Muzo. 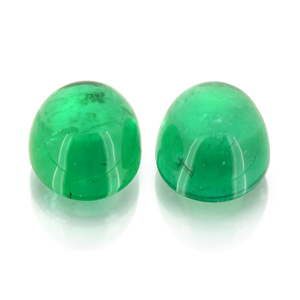 Certain characteristics of the crystal and matrix can be used to identify the source of the emeralds from Coscuez. The most characteristic feature is their frequent occurrence in aggregate-type formations with multiple terminations. 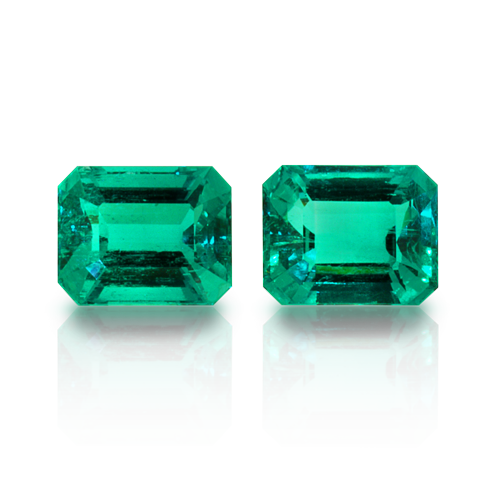 The emerald crystals from Coscuez are longer than those from Muzo but shorter than those from Chivor. 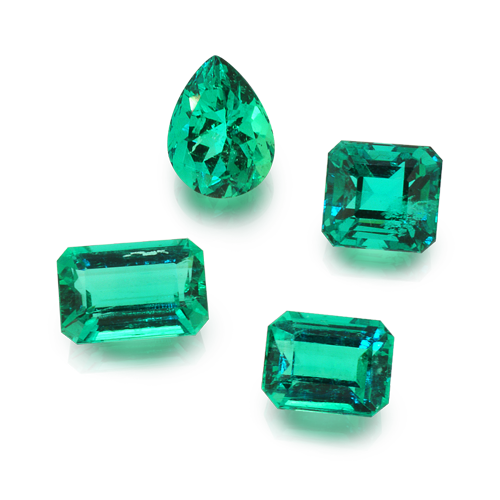 Color differences and inclusions in emeralds from Coscuez. 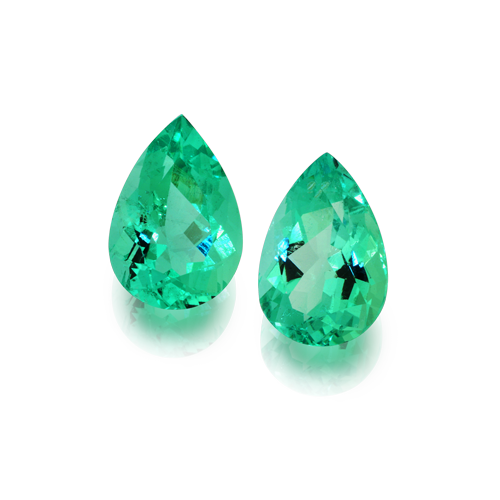 Emeralds from Coscuez generally have good transparency with a bright yellowish-green colour. It may not be possible to predict the source of these emeralds correctly from the colour alone. Coscuez emeralds have diffuse jardins and inclusions. Coscuez emeralds occur in black and grey shale, white and grey calcite and pyrite. The combination of these components differs with each source. In the Coscuez matrix the most predominant characteristic is the presence of grey calcite. 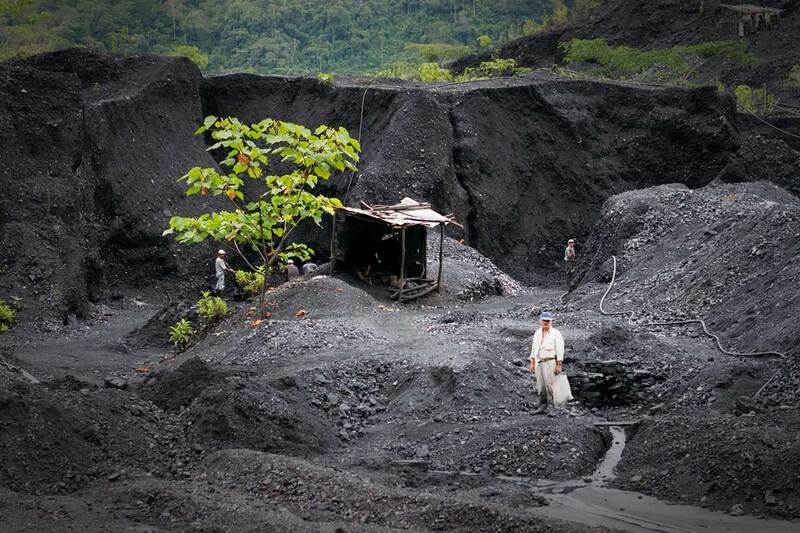 Chivor, formerly Somondoco, is the oldest mine in Colombia and is situated north-east of Bogotá. In 1537, Gonzalo Jimenez de Quesada conquered the interior of Colombia, locating the mine area which was worked by the Chibcha Indians. 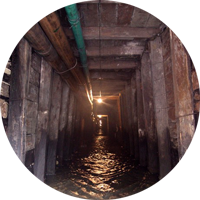 From 1540 until 1675 the mine was operated under incredibly harsh conditions and finally closed down. 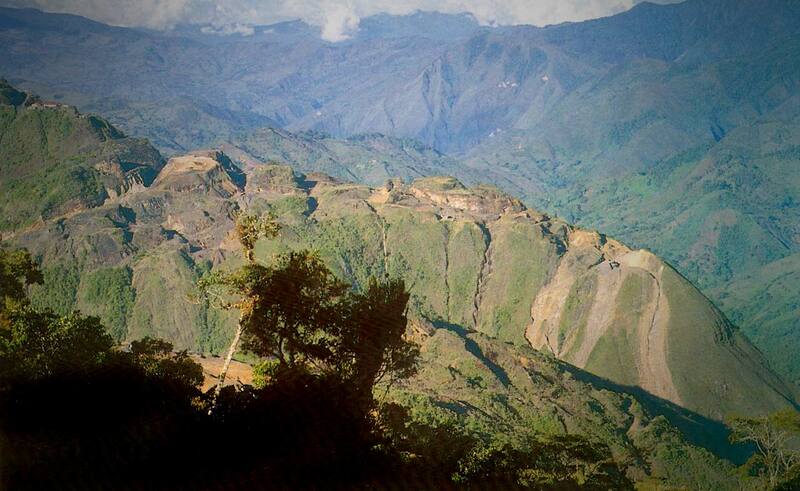 After 1828 the Colombian government leased the mine out. From 1911 the German Fritz Klein and his associate Don Francisco Restrepo worked it for a couple of years. From 1915 to 1931 the mine was worked under a new joint venture, the ‘Sociedad Ordinaria de Minas des Esmeraldas de Chivor’. From 1936 to 1996 the mine was operated sporadically. 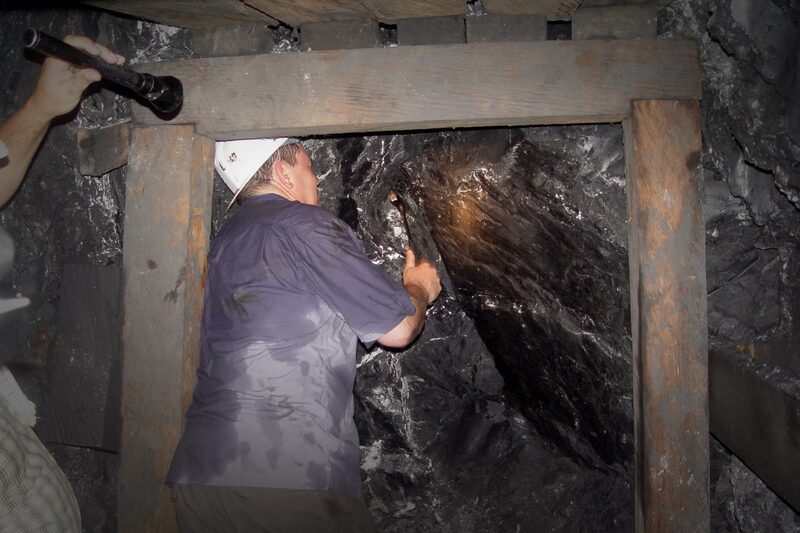 Starting in 1996, a Canadian company called the Chivor Emerald Corp. worked the mine for some time using sophisticated computer-aided mining methods. Chivor emeralds are famous for their colour, which shines even more strongly when they are held in half-light. Crystals from Chivor are always longish and do not form clusters or aggregates. Chivor emeralds have a lighter bluish-green colour and generally far fewer inclusions than Muzo emeralds. They have three-phase inclusions containing gas, fluid and crystals of halite together with pyrite and albite. In the matrix of Chivor emeralds greyish shale is combined with grey calcite and layers of iron oxide and crystallised knots of pyrite. The matrix is fragile and has brown stains caused by iron oxide. Because of this fragility, fewer specimens with the matrix still intact are found in Chivor.